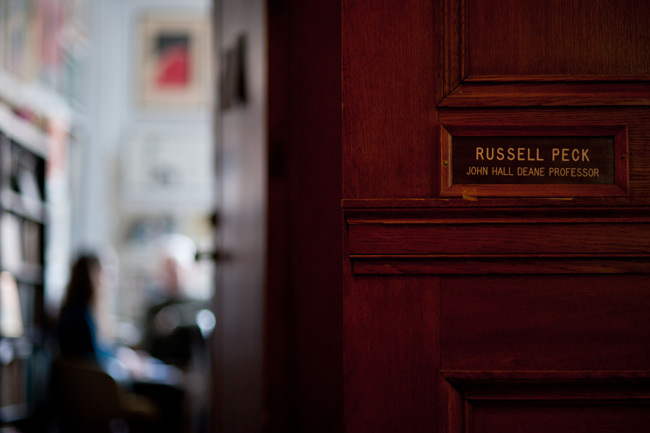 Russell Peck, the John Hall Deane Professor of English at the University of Rochester, is a teacher, scholar, farmer, gardener, digital entrepreneur, and, above all, an inspiration to his students, colleagues, and the scholarly community at-large. Very few teachers have more closely affected the intellectual and cultural development of our students than Professor Peck. Help honor his half century of dedication to the University by making a gift toward an endowment in the names of Russell and Ruth Peck, a permanent fund that would bear their names in perpetuity. 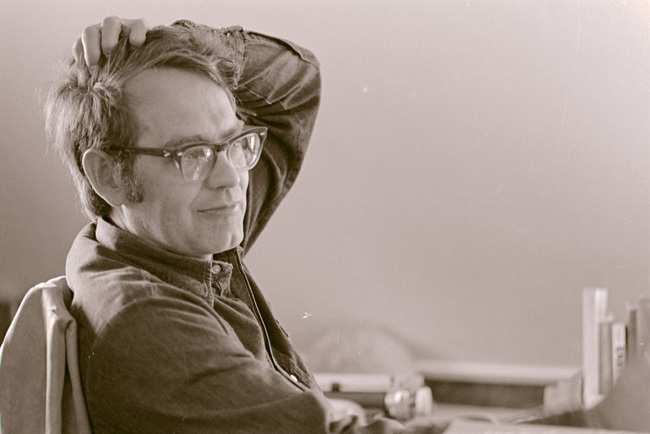 Professor Peck has taught hundreds, if not thousands, of students, and to this day, his courses consistently attract the most talented undergraduates. 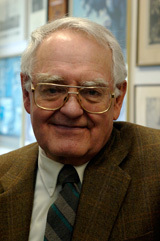 He has also been the guiding force and an instrumental contributor to the University of Rochester Medieval Society. 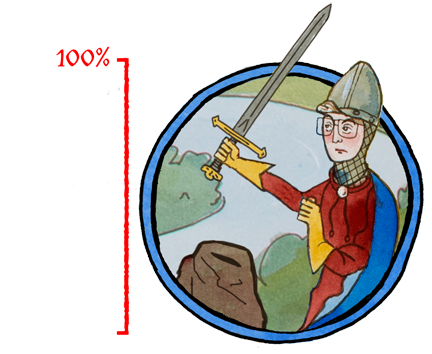 He championed the Consortium of Teaching Middle Ages project and its Middle English Text Series, too, transforming the study of medieval literature for undergraduate and graduate students around the world. 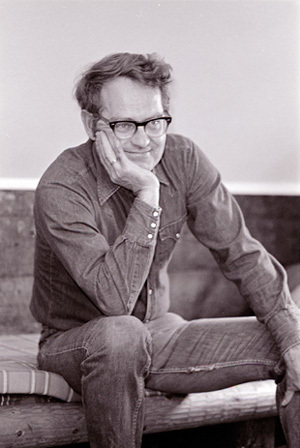 He and his wife, Ruth, also created and still run the Theater in London program, a two-week program held every winter break for the last 21 years. 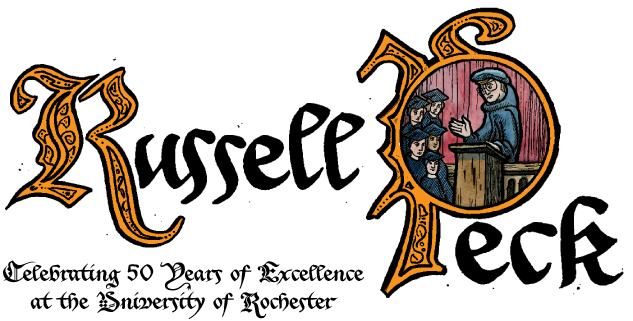 He was also the driving force behind bringing the Robbins Library to Rochester, a collection of highly regarded medieval texts. Professor Peck is a "ringmaster," too. His Department of English diploma ceremonies held every commencement are grand celebrations that his colleagues and alumni fondly recall. 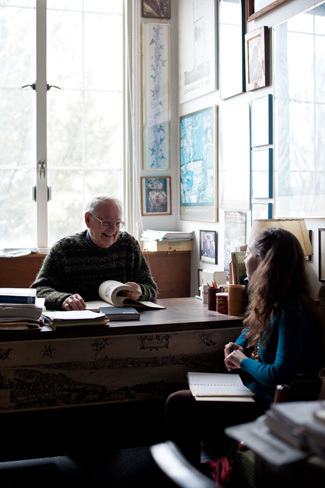 Professor Peck has made, and continues to make, a mark on the lives of many. 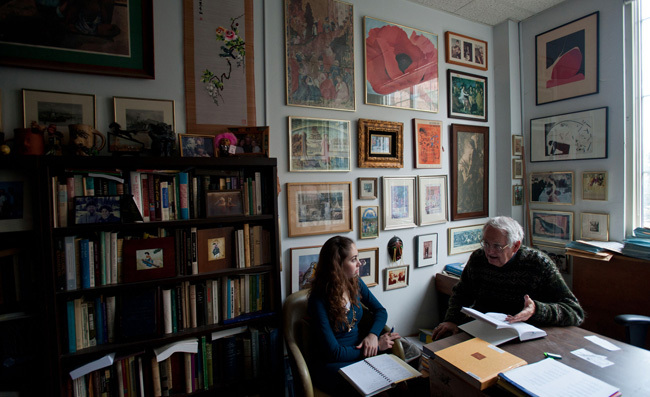 Professor Peck and others talk about his 50-year career with the University. 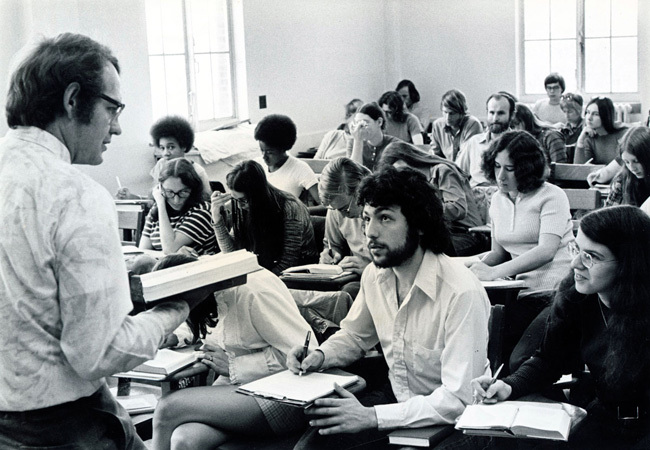 Take a stroll through the last half century and view highlights of Professor Peck’s career. 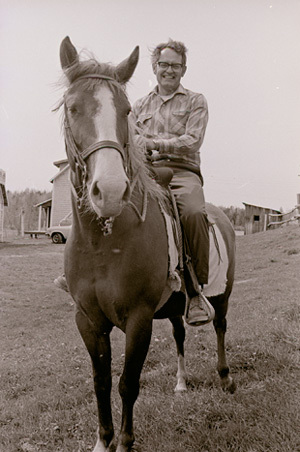 Over several years, Russell and Ruth Peck hosted Rochester classes at their farm in Ontario, Canada, where students met his horse, Butternut, and other animals while studying medieval literature. The Peck family. 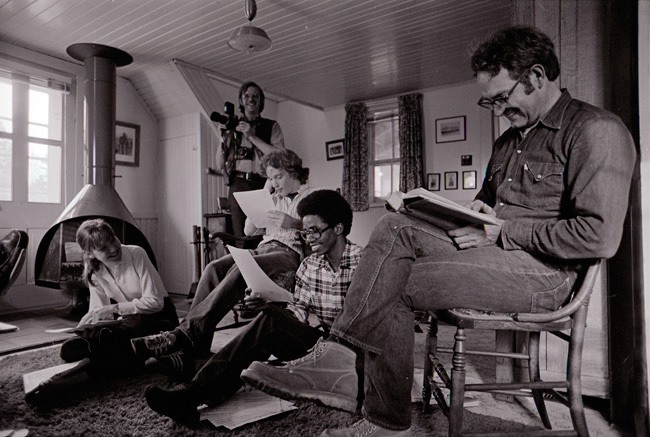 From left: Nathan, Gunther, Russell, Demaree, and Ruth. 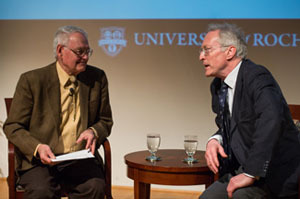 Peck moderates a keynote address by Diarmaid MacCulloch, Professor of the History of the Church in the University of Oxford, at the 2013 Ferrari Humanities Symposium. 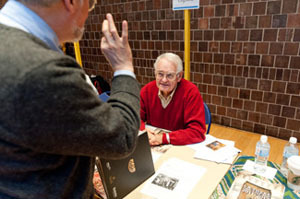 Peck staffs a table at the Study Abroad Expo in 2012. Peck has taught a four-week Theater in London course for more than 20 years. 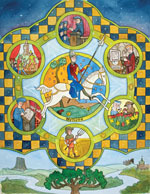 Professor Peck's storied lectures on the works of Chaucer have attracted and transformed Rochester undergraduates for decades. Professor Peck has captured the minds and hearts of so many. Share some of your favorite memories of him here. 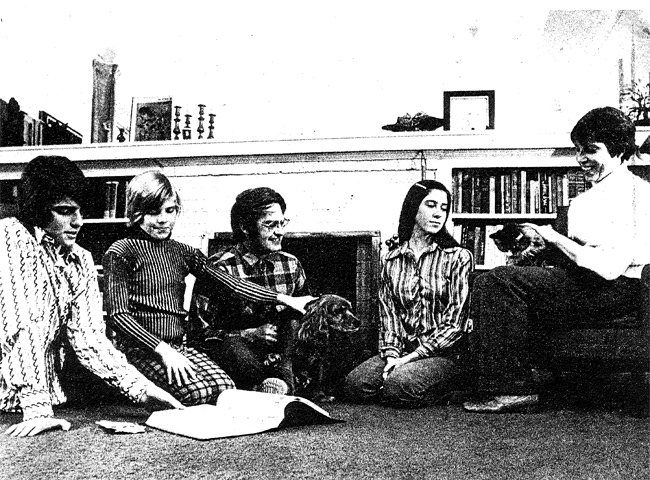 Have some photo memories of your own to share with Professor Peck? Upload your photos to Flickr and use the #professorpeck hashtag to post them here. Professor Peck has changed countless lives with his energy, passion, and commitment to his students and to scholarly achievement. Your gift will help continue his tradition of teaching excellence. Rochester Trustee Janice Willett ’78S (MBA) and her husband Joseph Willett ’75S (MBA) were so inspired by the Pecks' commitment to education and to each other they made the lead gift to the fund in 2012. The University’s goal is to raise at least $1 million by Dec. 31, 2013, to endow a position and honor the Pecks’ dedication to education and to the University.